Kratos AXIS Supra (front) and Kratos AXIS Nova (rear) X-ray photoelectron spectrometers at Surface Science Western. 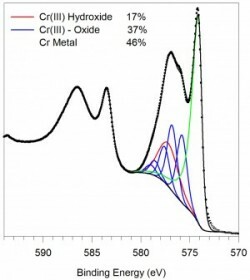 X-ray photoelectron spectroscopy (XPS or ESCA), is an analytical technique that depends upon the measurement of the energies of photoelectrons that are emitted from atoms when they are irradiated by soft X-ray photons (1 – 2 keV). When used to study solids, XPS analysis has a number of powerful attributes, including a high (and variable) range of sensitivities to structures on the outermost surface of the solid (outer few nanometres), an ability to identify such structures chemically, a reasonable capacity for elemental quantification, as well as the ability to determine structure thickness. As a method for characterizing surface composition, there is no single other technique that can compare with XPS, in terms of the wealth of useful information, reliability of the data, and ease of interpretation. Cr 2p high resolution XPS spectrum. Advancements in XPS spectrometer technology have resulted in major improvements in spectral resolution and counting efficiency over the past 20 years. This has dramatically improved the level of confidence in spectral positions, and the ability to carry out analyses in numbers that have much better statistical significance. The exploitation of the imaging developments is likely the most exciting prospect, because, historically, little research has been done using highly-resolved XPS images. The recognition of co-localization of different species (elemental or chemical) will be one of the most powerful elements shaping XPS analysis in the future. The principal XPS at SSW is a Kratos AXIS Supra spectrometer. The AXIS Supra delay-line detector offers unrivalled spectroscopic and imaging performance with high energy resolution, large area – high sensitivity analysis, small spot analysis and XPS imaging. 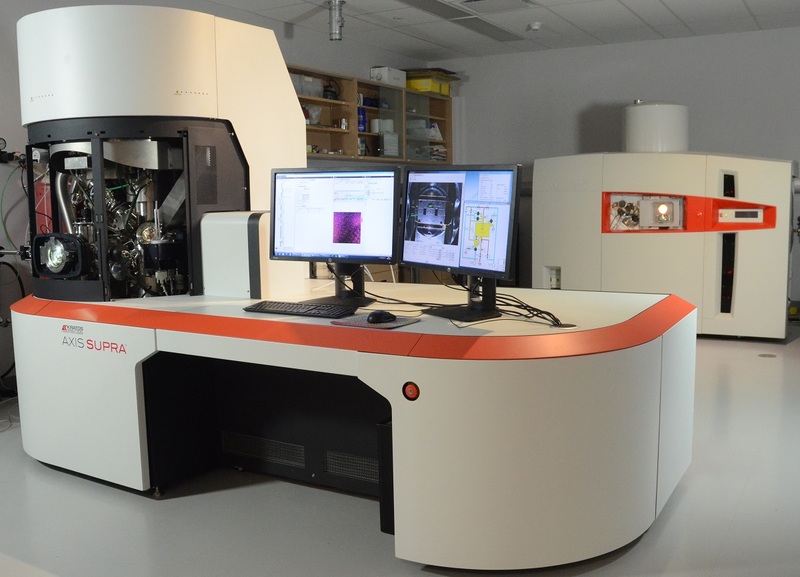 This instrument is also equipped with the latest gas cluster ion source (GCIS) for the ultimate in depth profile and surface cleaning flexibility. The second XPS at SSW is a Kratos AXIS Nova spectrometer. The AXIS Nova employs a monochomatic Al Kα X-ray source with a delay line detector (DLD) system. This detector allows for fast image acquisition, enhanced small spot analysis sensitivity, and true quantitative XPS imaging. The system employs an automated multiple sample platen system that allows for increased sample throughput. The XPS team at SSW also maintains the X-ray Photoelectron Spectroscopy (XPS) Reference Pages website. This site is a collection of curve-fitting procedures, reference materials, and useful tips on XPS analyses and spectral interpretation.